The following is a guest blog post by Gail Crowther, co-author of the recently published These Ghostly Archives: The Unearthing of Sylvia Plath (Fonthill). You can read a companion guest blog post by me, "Entering These Ghostly Archives" on Gail's website. As Peter and I note in the opening pages of our new book These Ghostly Archives: The Unearthing of Sylvia Plath, archives are not only magical places, they are places of power and politics too. And the power seems to operate in a number of different ways: the experiential power of holding original documents, the power and privilege to study in an archive, and the power behind who gets to have an archive of work in the first place. Much is about access and opportunity. Often we speak of ‘the archive’ as though it were some kind of monolithic, static space. Yet what we discovered as we worked on a series of papers between 2009-2013, and subsequently on our book, is that archives are far from fixed. They are diverse, living, animated spaces that constantly invite shifting perception. We can visit the same archive two, three or four times and find something different on each occasion. Plus archives grow all of the time and new material becomes available. In our book we challenge the notion of the fixed archive by arguing that archives are dynamic, and that this dynamism can seep beyond the walls of what might be called the ‘traditional’ archive into the ‘living’ archive, where history and stories leave their blueprint on the spaces around us. The first archive I visited was the BBC Written Archives Centre in Reading, England. Peter had asked me to look at some material on his behalf. We had already exchanged emails about Peter’s archival work, particularly at Smith College, which holds one of the largest Plath collections in the world. Peter had shared his enthusiasm for handling the Ariel poem manuscripts and early drafts of The Bell Jar, as well as personal possessions such as pieces of painted furniture, trinkets, and correspondence. While I was aware that Peter was an archivist by profession, I could also tell that there was something different going on with his engagement with Plath material. I didn’t know at this stage about ‘archive fever’ or how when you work with materials in an archive, time dissolves around you. Over the coming years we worked separately (but on each other’s behalf) in a number of different archives – and only once on a joint trip to Smith College in the summer of 2011. The nature of these visits changed as we realised we could utilise the fast-paced technology that was developing. In 2008 we would email each other as soon as the archive visit was over, type up notes, and send on as soon as possible. Today, we can WhatsApp while we are actually in the archive and, if allowed, take photographs and share documents with an immediacy that often makes me feel I am there, albeit virtually. This immediacy can be helpful if we stumble across an ethical issue, or if we make an exciting find that we cannot wait to share. Both of these scenarios we discuss in our book, in particular decisions that have to be made regarding whether to publish certain things or not. We tend to err on the side of caution, especially if stories involve other people who are still alive. The archive can be a place of exposure and sometimes people get drawn into a story via secondary sources when they have personally chosen to keep their silence. And silence of course, oddly, is another feature of the archive. Although they teem with stories, there are maddening gaps too. Fragmented correspondence, missing pages, references to letters, poems, prose that no longer exist. In Plath’s case, a whole ‘missing’ novel manuscript and two ‘missing’ journals, two torn out pages from her 1962 wall calendar, and even torn out pages from the journals do that survive. The silence can jolt you from a smooth-running narrative into confusion and speculation. But this silence also invites further study; when something is missing, can it be found? This forms the basis for the first chapter in our book where we follow the trail of a missing manuscript, the final piece of prose that Plath wrote before her death, which was stolen from the BBC shortly afterwards. Missing archives, lost archives, in many ways are the mostly ghostly of all – certainly elusive, but still holding out promise. And that in many ways is the power of the archive – the story is never fully told and it is a story that we may one day know, or not. 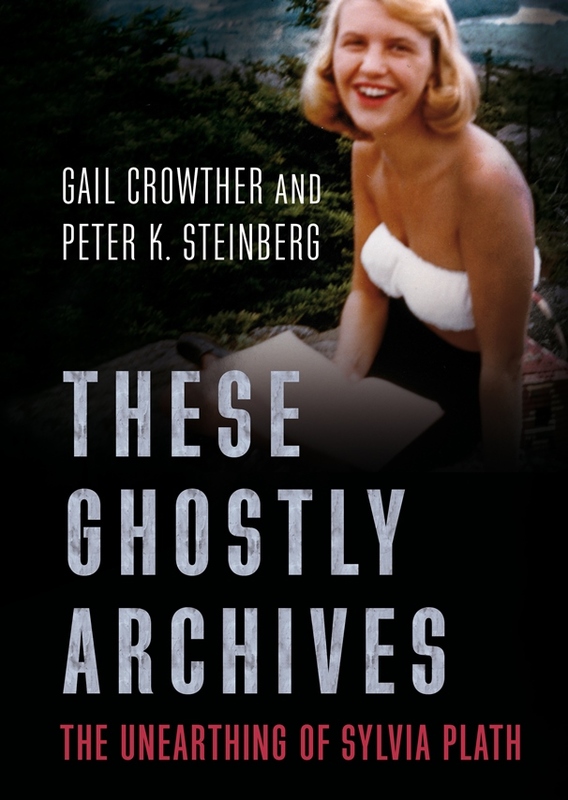 These Ghostly Archives: The Unearthing of Sylvia Plath by Gail Crowther and Peter K. Steinberg is now available. Published by Fonthill Media, the book is available online via the publisher, Amazon.co.uk, Book Depository, and other websites. These Ghostly Archives will be published in the United States on 3 October 2017. All links accessed 9 and 12 May 2017. These Ghostly Archives: The Unearthing of Sylvia Plath Out Now!!!! These Ghostly Archives: The Unearthing of Sylvia Plath by Gail Crowther and Peter K. Steinberg (hey...that's me!) is officially published by Fonthill Media as of today, 11 May 2017. We sincerely hope that if you read the book you enjoy it. These Ghostly Archives is available online via the publisher, Amazon.co.uk, Book Depository, and other websites. All links accessed 11 May 2017. The following is a catalog of the items in Sylvia Plath's high school scrapbook held by the Lilly Library in Plath mss II, Oversize 3. 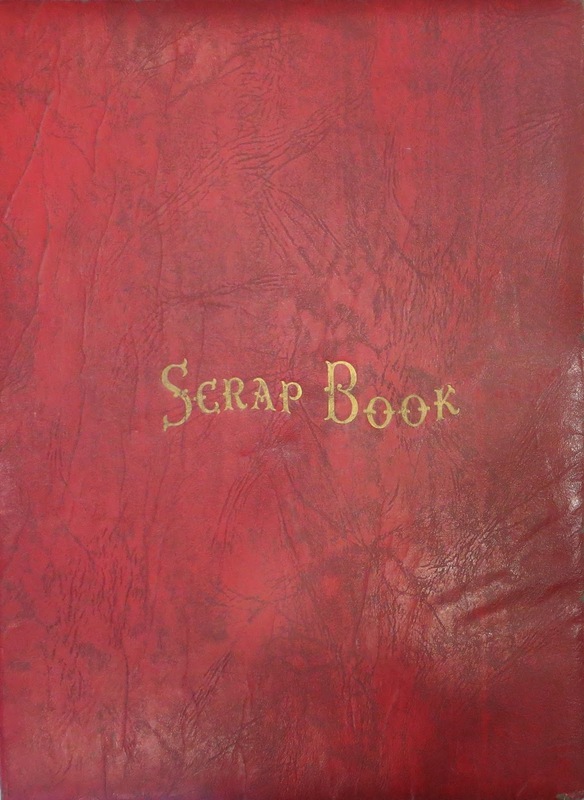 The scrapbook is heavily annotated by Plath and, as the writing is under copyright, is not included here. However, I think the rest of it is fair game to present and to describe. For this, I assigned three broad categories to the items in the scrapbook: Photographs, Attachments, and Clippings. Attachments take many different formats including cards, letters, and pressed flowers, to name a few. I have researched as many of the items herein and, as much as possible, I attempt to provide information about the things which Plath collected and preserved to document her life and times. For the clippings, I have tried to identify all the periodicals from which the thing was taken. Sadly, a number of items from the scrapbook are missing. Plath purchased this scrapbook on 1 February 1947 and immediately started pasting in the first pages photographs and annotating them with her life history and experiences. She numbered the pages in the top right or top left (she double numbered pages 39 and 46 and these are represented below as pages 39a and 46a, respectively). 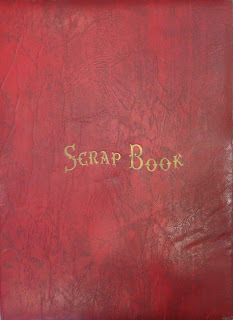 The scrapbook was obtained from the Book Stall in Wellesley Hills Square. Though it covers Plath's life from 1932-1951, the bulk dates for this scrapbook spans 1947-September 1951. She began another scrapbook, called her "Smith College Scrapbook" with events from her sophomore year at Smith College in the fall of 1951 and ended it in the summer of 1955. The same treatment as is given here will be given to Plath's Smith scrapbook in another blog post. The information here was obtained from 16-19 March 2015 on a research visit I made to the Lilly Library. The contents reflect what I saw and photographed at that time. By my counts, there are, or were, 287 items in the scrapbook: 133 Photographs, 106 Attachments, and 40 Clippings. There are, or were, 8 missing items (5 photographs, 2 attachments, and 1 clipping). There are three blank pages (12, 58, and 66). Excepting the missing photographs, each of the photographs has a date assigned to it. The dates are as accurate as I have been able to establish from a variety of sources including the scrapbook itself, Plath's diaries, journals, letters, and other sources. Photographs have been described based on a list of photographs provided by the Lilly Library and my own observations. "My Scrapbook / Sylvia Plath – 1947"
Photograph: Sylvia Plath, as a young child, age 22 months, playing in the water at the beach; captioned on verso by ASP: "Aug. 23, 1934"
Photograph: Sylvia Plath, as a young child, age 2½, seated on a sled in the snow; captioned on verso by ASP: "Jan 1935"
Photograph: Sylvia Plath and Warren Plath, as children, riding together on a sled in the snow, Winthrop; captioned on verso by ASP: "1938"
Clipping: "8-Year-Old Poet." The Boston Herald. 10 August 1941, p. B-8. Clipping: "Funny Faces." The Boston Herald. August 2, 1942: B-10. Missing. Clipping: Stimson, William. "Wellesley Artists Win Many Honors in High School Art Exhibit." The Townsman. 6 March 1947: 9. Attachment: 'Ice-Breaker' 1947: "THE SENIOR AND JUNIOR CLASSES CORDIALLY INVITE SYLVIA PLATH TO THE SOPHOMORE ICE BREAKER TO BE HELD AT WELLESLEY HIGH SCHOOL ON OCTOBER 4, 1947 AT 8:15 P.M. to 11:45"
Photograph: Sailboat; captioned on verso: "Mig's Boat / East Chop Races / July 2, 1947 / Vineyard Sailing Camp". Attachment: Ticket stubs, stock car races, Westboro Stadium, Route 9 – Westboro, Mass. Attachment: Ticket stub; Boston and Maine Railroad; visit to Williams College, Williamstown, Mass. Clipping: "Junior Prom To Be Gay Event This Saturday." The Townsman. 16 March 1950: 7. Attachment: Bus ticket to Durham, N.H.
Clipping: Goldsmith, Sue. "Highschool Highlights." The Townsman. 8 June 1950: 7. Photograph: Sylvia Plath, outside in front yard, seated and wearing white blouse by fence, Wellesley; circa June 1950. Photograph used to accompany "Ode to a Bitten Plum" published in Seventeen, November 1950. Clipping: Walker, Eldon. "Footlight Highlights." The Townsman. 26 January 1950: 10; fragment, regarding George Bernard Shaw's The Dark Lady of the Sonnets. Clipping: "Unitarian Jefferson Fellowship Meets." The Townsman. 26 January 1950: 9; accompanies article "Youth To Lead Service at Unitarian Church"
Attachment: "Smith College", likely from a pamphlet? Attachment: Sylvia Plath name card with red ribbon, "Sylvia Plath, Wellesley, Mass., Haven House"
Attachment: Sabrina. October 1950, (cover); depicting a bar called "Darsie's"
Attachment: "Welcome 1954 to Freshman Day – 1950, Amherst College"
Attachment: Joe's Northampton menu, with Pabst Breweries bottle label affixed; annotated by SP: "October 27 – Birthday Dinner"
Attachment: Birthday card signed "To Sylvia with love, Diane and Reggie"
Photograph: Marcia Brown on skis, Francestown, New Hampshire; captioned on recto by SP: "FEB 4, 1951"
Photograph: Sylvia Plath on skis in the snow, Francestown, New Hampshire; captioned on recto by SP: "FEB 4, 1951"
Photograph: Sylvia Plath standing in the snow about to throw a snowball, Francestown, New Hampshire; captioned on recto by SP: "FEB 4, 1951"
Photograph: Marcia Brown sitting in snow, Francestown, New Hampshire; captioned on recto by SP: "FEB 4, 1951"
Attachment: Pearl Primus, Dark Rhythm program, John M. Greene Hall, 7 February 1951. Attachment: Request Card, Lou Terrasi's restaurant; SP asked them to play "When the Saints Come Marching In". Attachment: Placemat; visible text printed: "Simple Simon Seek A Pieman White Going To The Fair…", annotated by SP: "May 10, 11, 12 –"
Attachment: "The Top Papers in the Contests", Unknown periodical, circa 1950, page 31; "243. 'Seek No More the Young' by Sylvia Plath, Gamaliel Bradford Senior High School, Massachusetts, Wilbury A. Crockett, Instructor"; annotated by SP. Attachment: Check stub, Christian Science Monitor, 15 March 1950, $5.00 "Letter on Atomic Energy"
Clipping: "6 School Editors Win Globe Scholarships" by Elizabeth Watts. The Boston Globe. 25 May 1950: 1, 8. Attachment: "Your Passport to Successful writing"